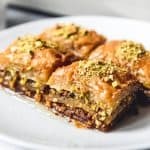 Turkish Baklava, also known as Fistikli Baklava or Pistachio Baklava is a deliciously rich, buttery, sweet dessert made from phyllo dough, finely ground pistachios, butter, and a syrup made from sugar, water and lemon juice. That's it! In a medium pot, combine the sugar and water over medium-high heat. Bring to a boil, then reduce the heat to medium-low and simmer for 20-25 minutes, until slightly thickened and golden in color. Stir in lemon juice, then cool completely in the fridge until ready to use. Make the clarified butter (see explanation in post for more information on how to do this) and finely chop the pistachios. Heat oven to 350 degrees F and brush a 9x13-inch baking dish clarified butter. Trim the phyllo dough to fit the baking dish, if needed, and cover with a damp kitchen towel to keep it from drying out while assembling the baklava. Carefully separate 1 sheet of phyllo from the stack and lay it on the bottom of the baking dish. Brush the phyllo sheet lightly with clarified butter. Continue to layer 8-9 more phyllo sheets on top, brushing each sheet with butter until 10 sheets of phyllo have been stacked in the bottom of the baking dish. Sprinkle 1/2 of the chopped pistachios over the phyllo base in an even layer. Repeat the process to create another 8-10 sheet layer of phyllo and butter, followed by the remaining 1/2 of the nuts, and another top layer made up of the remaining phyllo sheets and butter. Slice into 36 pieces with a sharp knife, making sure to always cut through all layers of phyllo. Bake for 60 minutes, until the top is golden brown, and the bottom phyllo layers are baked through. Use a knife to lift up a corner of one of the rectangles to see if the bottom layers are done. Check the baklava after 40 minutes and cover with a piece of foil over the top if the baklava is getting too browned. When the baklava is done, remove from oven and slowly pour the cold syrup over the hot baklava. The syrup will likely bubble up and some may even overflow. Sprinkle the top of each piece of baklava with the remaining finely chopped pistachios. Let the baklava cool completely before serving at room temperature. You do not have to use all of the syrup if you feel like it is too much or you don't like your baklava too wet. Adapted from New York Times.